There is increasing interest in the United States and abroad in implementing electronic health records as part of an effort to improve the process, cost, and outcomes of health care. 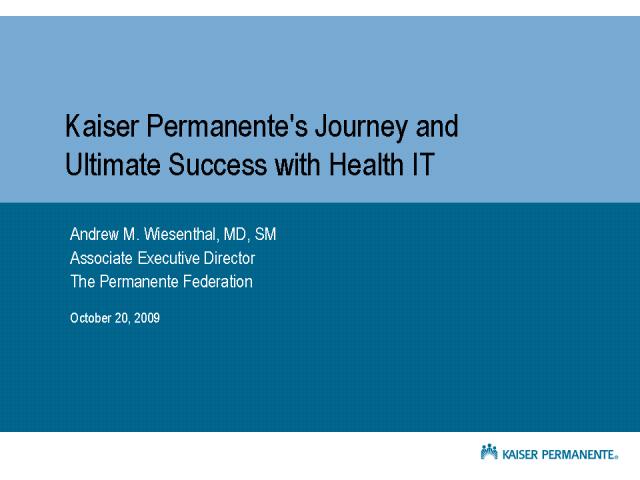 Kaiser Permanente has been working toward a goal of automating all health information on its 8.6 million members. Work began, in some ways more than 30 years ago. With focus on a vision for health care in the 21st century, our Kaiser Permanente HealthConnect® electronic health record has been fully deployed in all of our 431 medical offices, and 33 of our 36 hospitals (the remainder will be completed in the first quarter of 2010). We have also deployed a personal health record actively used by more than 3 million members. Along the way to this success, we have made mistakes and learned many hard lessons. The presentation will share that experience and describe some of the benefits of the system. Health innovations including wearables, sensors, big data analytics and 'behavior changing' applications and devices are ubiquitous. These technologies promise so much yet are they really benefiting the healthcare consumer? And what does the future look like? This presentation highlights some real world examples of this technology in use today and some insights into what the future may hold. Google is a major contributor to Healthcare in many areas. Perhaps the biggest is "Dr. Google" where the patients searches for medical information about symptoms or conditions. In addition, Google has been a major contributor in the area of Medical Devices, as well as to the creation of medical communities, such as Genomics. Join John Bennett in this exciting webinar to discover all Google innovations in healthcare and discuss the importance of tech giants in building better experiences in this area. Speaker bio: John Bennett MD, is an ex-ER Doctor, creator of the website www.InternetMedicine.com, and self-professed Geek, who rediscovered his passion for Medicine once computers became useful. Some of the most critical data required to solve analytical problems in the healthcare and life sciences world lack the type of keys that we rely on so heavily in other domains. This session will focus on solutions to the fundamental data connectivity challenges in this area and how to enable impactful analytics on a few high value but disconnected healthcare data sources. With the emergence of big data healthcare analytics, electronic health information exchange, clinical data warehousing, and other technologies for optimizing patient care, the healthcare industry has never been more reliant on electronic data and the strict requirements associated with the data. The advances in business processes, technology and regulations require that data security initiatives evolve to address new and growing threats. Coincidentally, in a recent survey, 69% of organizations felt that provisions of the Affordable Care Act (ACA) have the effect of increasing or significantly increasing risks to patient privacy and security. - Why compliance is an outcome of an effective data protection program. - Risk assessment, analysis and management – what’s the difference and why you need them. - What is considered ‘reasonable’? - What leading healthcare organizations are doing today to protect data, with a focus on securing Big Data for healthcare analytics? - How data protection can help without getting in the way of patient care. - How do you protect from your healthcare organization public loss of confidence? HealthBridge is a nationally recognized Health Information Exchange based in Cincinnati Ohio that has been in operation since 1997 and is regularly cited as an example of a financial sustainable HIE effort. Rodney Cain, Chief Information Officer will discuss the history and development the HealthBridge with a focus on strategies and lessons learned over the years as the chief technology architect of the HIE effort with an eye to the future and the impacts of HITECH and Meaningful Use. HealthBridge has grown to a nationally recognized HIE that includes 24 hospitals and over 5000 physicians in Ohio, Indiana and Kentucky and also provides support via the Collaborative Communities Model to HIEs in Bloomington, Indiana and Springfield, Ohio. HealthBridge was recently selected by the Office of the National Coordinator as one of the initial 32 HIT Regional Extension Centers. Rodney is also involved in several HIT standards development processes and HealthBridge is one of the 15 organizations in the ONC Nationwide Health Information Network Collaborative (NHIN) effort. Learn how a community is successfully pursuing health information exchange, interoperability and meaningful use across small and medium practices, hospitals and facilities using a combination of tools, guidance and incentives. This "Roadmap to Meaningful Use" program helps providers realize the quality, efficiency and financial incentives promised in the ARRA Stimulus funding. •	Telehealth is for everyone, not just the elderly. •	Patient self-diagnosis is good and should be promoted. •	Personal health records are not just a passing trend, they are the solution. Electronic health records may generate a new set of potential healthcare compliance risks and vulnerabilities. The new risk areas, including, the lack of authentication issues, over-documentation and/or cloning, may have significant ramifications beyond billing and coding. Electronic documentation tools offer exciting features designed to enhance communication for most health record users. The use of the system or specific features without appropriate education, training, infrastructure and monitoring may generate data integrity issues, manufactured documentation, increased risk exposure or even undesirable clinical outcomes. This presentation addresses certain areas of concern and discusses potential approaches for detection, evaluation and corrective action. When I tried to move my health data from my hospital to Google Health, what happened was front page news; the transfer was so bad it was covered by the Information Quality Trainwrecks blog. But that doesn't change my conviction one bit: Good quality data, well managed, can vastly empower the new world of doctor-patient collaboration known as Participatory Medicine. As an empowered e-patient, a business process analyst and a day-job data geek, in this talk I'll lay out the Society's vision for the role a good EHR can play in creating more efficient - and more effective - healthcare, in ways that benefit providers and patients alike. Use of the Internet and the web for EHR technology. Explicit design for information sharing and online communication among providers and patients/consumers. A modular or component architecture upon which applications can be aggregated to meet specific clinical and workflow tasks. Patient/consumer engagement tools that facilitate ongoing health management and care coordination. Interface and data exchange standards for information sharing that emerge in a market-driven manner. The Clinical Groupware Collaborative is in a formative stage organization. To date, representatives from over 50 companies have expressed interest. We are working to be formally incorporated in November 2009.
Business Associates first made their appearance in the HIPAA regulations almost a decade ago. During the first few years under the HIPAA regulations business associates used PHI of a HIPAA covered entity to do work for the covered entity including claims processing, data analysis, utilization review, benefit management, and practice management. In other words, the work was in the areas of administration, payment and health care operations. This electronic data sharing was between no more than two or three entities. The world has advanced and we now have Electronic Health Records (EHRs), Personal Health Records (PHRs), Regional Health Information Organizations (RHIOs) and Health Information Interchanges (HIEs) that share clinical information electronically. This data sharing is among a much larger universe, among many more entities, through much different technologies. Until the HITECH Act PHRs, RHIOs and HIEs were not business associates. Business associates now include these new forms of clinical data repositories and sharing organizations and must keep most of the HIPAA privacy and security requirements as if they are covered entities and not just through a contract, a business associate agreement with a covered entity. This session will outline the new world of business associates in clinical information sharing. This panel, moderated by David Maizenberg, will feature former Division Director at FDA and 30 year biopharma veteran, Max Talbott, Joanna Napp, Healthcare and IP partner at Jackson Walker, and health care law expert Jeffery Drummond. The discussion will cover FDA regulation of Internet-based communications by biopharmaceutical companies, starting with the recent keyword advertising warning letters and subsequent draft regulations. The panel will also delve into possible scenarios for biopharmaceutical company participation in conversational and social media: the next frontier for communications with doctors, patients and wider communities of interest. The patent system is based on a social contract between the inventor and the state. In return for a disclosure of the invention by the inventor, the state grants the inventor or his assignee a period in which he can exclude others from using his or her invention. The two sides of this contract are reflected in the two principle parts of a patent:1) the description of the invention and how to put it into practice and 2) the claims or definition of the invention which determine who one can sue for trespassing onto one's invention. In recent years the courts have placed increased emphasis on trying to establish a proper balance between the contribution made by the description and the permissible breadth of the definition set out in the claims. Different countries can take different views as to where the balance point should lie. In today's global marketplace, such differences can be very important. In this presentation we will look at how pharmaceutical inventions may be defined and the requirements of the disclosure in order to support such definitions with particular emphasis on issues that arise as one moves from an appreciation of the significance of a new biochemical discovery to using that discovery as a basis for treatment. If one files a patent application too early with insufficient disclosure the courts may conclude that one is merely speculating and not entitled to a patent because "the invention" has not yet been made. If one waits too long, noe may lose the race to the patent office. The presentation will try to untangle the issues involved. The current business model for biotech and pharmaceutical companies is broken. Every aspect of R&D has changed over the last 20 years, yet analysis of the industry is still based on oversimplified models. As a result of this global financial crisis, the impact of reduced research budgets of pharmaceutical and biotech companies will be played out for the next 3-5 years. There is a need to develop new therapeutics and appropriate business models that clearly demonstrate the compelling value to invest in, and develop, new therapeutics. Four compelling reasons challenging assumptions on investment and motivations discuss why walking the path less traveled could make all the difference. An opportunity exists; with new business models, collaboration across the industry and hard work, success can be exploited from this situation. This channel will feature presentations by influential representatives from academia, producers, healthcare providers, payers and regulators to explore hot topics in healthcare. Thought leaders will debate the scientific, economical and political challenges and propose viable solutions to optimizing healthcare and medicine.